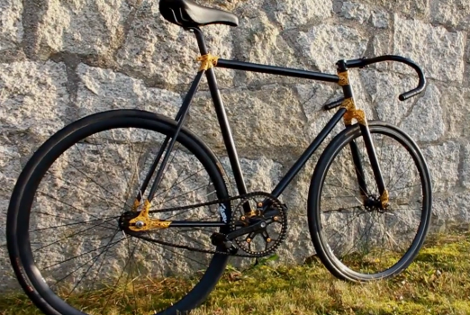 We haven’t heard much about 3D printing using stainless steel as the medium, but that’s exactly what’s going on with the lugs used to assemble this bicycle frame. They’re manufactured using LaserCusing, which is a brand name for parts produced using Selective Laser Melting. The video after the break gives you an overview of what it takes to clean up each of these parts. The laser melts metal power to solidify areas needed in the final part. Just like the hobby printing we’ve seen on the RepRap or Makerbot there are structural supports necessary to complete the print job, and these need to be removed after the laser has done its work. This is where the majority of the labor comes in. You’ll see a ton of waste material pulled out of the cage-like lug, and we’re sure there’s no shortage of filing and polishing to finish up. But wow, what an interesting result. We just need to figure out if anyone has found a cost-effective way to hack together one of these metal-powder printers. It’s difficult to contain our excitement for this tiny quadcopter project called the Picopter. [Frank] managed to pull together an impressive collection of features when developing the project. 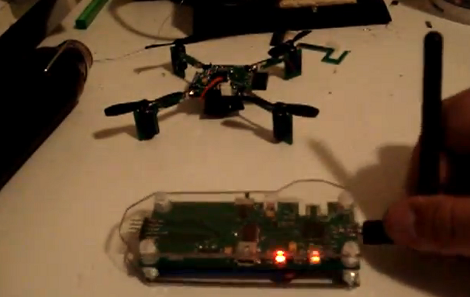 First off, the quadcopter itself uses all-PCB construction. Even the supports for the motors are PCBs with keyed slots to mate perpendicular to the main control board, then held firm with solder joints. We think this will be a more resilient option than this other all-PCB build. The control board seen in the foreground has an edge connector which mates with a Wii classic controller connector. This is what you use for flight control. But there’s even more. The pinheader just visible on the left side of the controller mates with a socket on the ‘copter board. This allows you to sync the two so that there’s no radio frequency interference, and recharge the batteries from a USB connection. Speaking of those wireless communications, [Frank] chose to use an ATmega128RFA1. This is a newer microcontroller from Atmel that has a radio built into it. 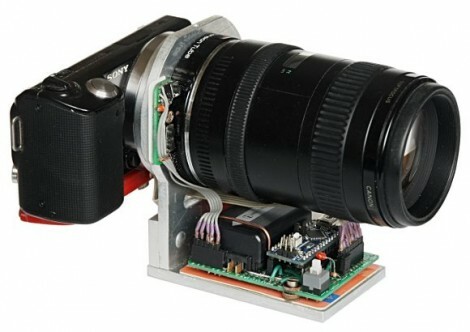 Add a gyroscope sensor and some motor control and you’re in business. [Alex] built an add-on board for his TI launchpad that lets him use it as a wireless controller for an RGB lamp (translated). As you can see above, the board has a pair of female pin-headers which make it easy to install or remove the board. This way you can use it for other projects without any hassle. The board itself doesn’t have any buttons. 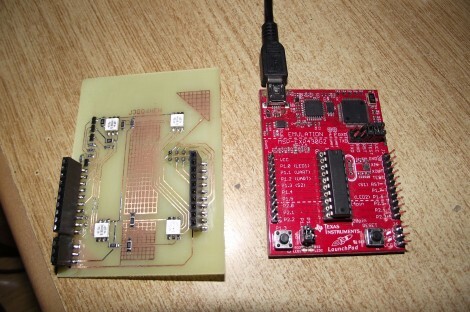 Instead, [Alex] etched a two-sided PCB, including pads for use as capacitive touch sensors. Here we only see the underside of the board, which hosts four RGB LED modules. These give feedback by showing the levels which are about to be set for each color. In the clip after the break you’ll get a good look at the touch sensors. There are two that act like buttons, scrolling through each color channel, and sending the updated values to the lamp via a wireless module mounted on that same side. There are also four pads which act as a slider. We didn’t see any code but apparently this uses one of TI’s touch sensor libraries. The real value of this hack is the guide he wrote to send key presses from the Arduino hardware. It’s not hard at all, but there are several steps and this will get you up and running in no time. Where might you go from here? It wouldn’t take much to turn this into a keyboard prank that misspells all your words. 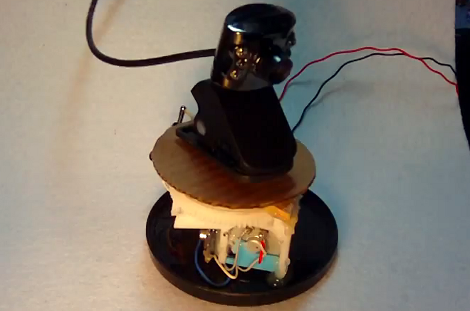 [Valentin] used a simple concept to build this auto-reversing rotating platform. The concept is extremely simple, the leads for the motor are attached to a double-pole double-throw switch which allow the polarity to be reversed. Flip the switch in one direction and it spins clockwise. Flip it in the other direction and it spins counter-clockwise. Straight from the Aerospace Controls Laboratory comes a variable-pitch quadrocopter designed by [Mark Cutler] and [Jonathan P. Howe]. While real, full-sized helicopters always have variable pitch rotors, changing the pitch of the blades on remote control aircraft is a fairly uncommon modification. When it’s done right, though, being able to easily change the thrust direction of a propeller leads to very cool flights, like having an airplane hover nose down. [Mark] and [Jonathan] identified two interesting techniques that a variable pitch quadrotor can bring to the table. The first is trajectory generation – because of the added maneuverability, their quadrotor can perform more aggressive banking turns when following a preprogrammed path. The second benefit to their design is quick deceleration. In the first video after the break, you can compare the deceleration rates of a variable pitch and fixed pitch quadrocopter. While the fixed pitch quad continues climbing after being commanded to stop, the quadrocopter outfitted with variable pitch rotors can stop on a dime. We’re still waiting for the equivalent of the Red Bull Air Races for quadrocopter builds, but when it comes we know what would win the slalom event.